I know many of us are not in school during the month of July, but that doesn’t mean our children can’t keep up with some skills! Even when we are not “in school” my children still read and write every day. And when there are fun worksheets and projects presented, they love doing them, no matter the month! So, I try to always have educational things on hand for them to pick up at will. Copywork sheets, based on the season or upcoming holiday, have been a bit hit at our house. I have made some copywork sheets for you to use with your students. 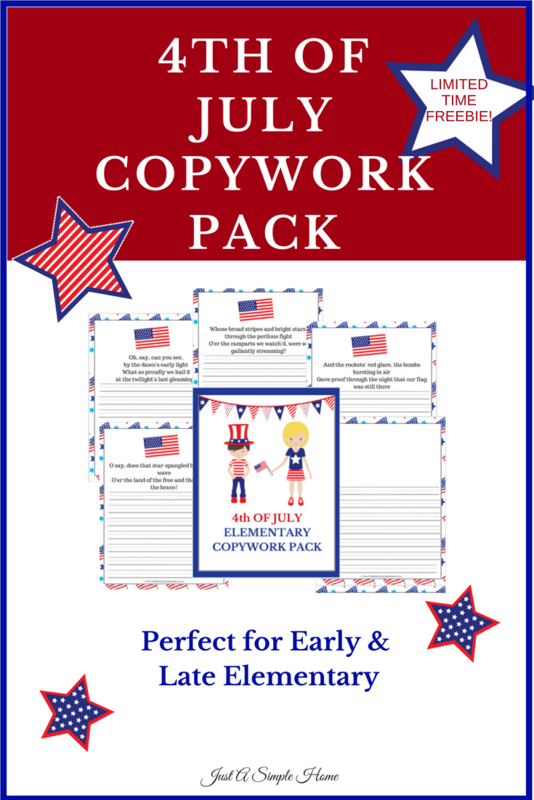 These 4TH OF JULY Copywork sheets have plenty of room for your student to write. WHO IS THIS PACK INTENDED FOR? My 6th grader still enjoys using the blank page to do her copywork and draw on the top part. GET YOUR COPYWORK PACK NOW! This would be fun to get for my grandchildren. What a wonderful way to help celebrate the 4th of July. These are really cool thank you for offering them. They look so fun and festive. Thank you for sharing this. I am always on the look out for ideas for my children for the different holidays. What a nice resource to help teach children about patriotism! The artwork is so fun and festive for children! PInning!